A year ago I met with Dr. Vilich to address my concerns with my memory (my mother has Alzheimer’s) and I was experiencing brain fog. I had read Dr. Bredesen’s book The End of Alzheimer’s and was looking for a practitioner who used his protocol. I was also experiencing digestion problems, weight gain, cold all the time and general fatigue. And what a difference a year has made. Dr. Vilich recommended testing and supplements specific to my problems and life history and one by one each symptom has gotten so much better. I now have energy, losing weight, clear headed and my anxiety over the future is all but gone. Dr. Vilich is great and this has changed my life! I treated with dozens of doctors over the years trying to find an answer to my digestive issues, fatigue and muscle pain. Through testing conducted by Dr. Vilich, dietary changes and supplements, I am feeling better than I have in many years. The IBS that plagued me my entire life has now resolved. I have energy to work full time and go to the gym after work. I am sleeping well and feeling like life is once again enjoyable. Though the changes have been a lifestyle adjustment, it has been worth the effort. Dr. Vilich is the only doctor that truly had the answers that brought me to good health. Dr. Vilich has transformed our lives! My husband, age 73, and I, age 65, have been seeing Dr. Vilich for ten months. Both of us have lost 50 pounds each and are still losing. We have much more energy and feel the best we have felt in years! In fact, my husband had given up golf due to pain from past knee and shoulder surgeries as well as foot pain from a “dropped” toe. After working with Dr. Vilich, he tried golf again and is pain-free so has re-joined his golf club. As for me, I had years of arm, wrist, and hand pain and numbness and was seriously considering carpel tunnel surgery. Thank goodness that I waited… I am completely pain free now and the numbness is gone, too! Dr. Vilich is truly concerned about her patients, and we continue to benefit from her expertise and caring style. About our journey… Last summer my wife Marcia was told by her internist that she would have to begin taking medication to control her developing diabetes, as her then recent A1C was over the 6.0 limit. She was a wreck emotionally after that visit. She was already on cholesterol medicine, two heart medications and an antibiotic for rosacea. She was without hope as we were eating mostly organic foods then and didn’t eat fast foods at all. She was confused and fearful. 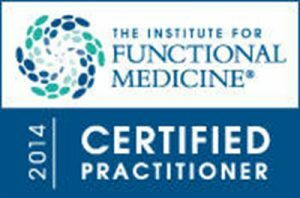 The premise of the functional doctor’s approach is this… they look at the body in totality–with all the markers and test results, so to reach a conclusion of what needs to be fixed in your health practices and/or diet. They believe that food can be a medicine to heal you or a poison which will ultimately make you ill or even kill you. Funny thing is that as we have worked with this program to “heal” ourselves we feel better, are stronger, with more endurance and energy. I remember well in our first 4-hr visit back in October with Dr. Vilich; she asked us to remember back to the last time we felt good! What a question. Marcia said it was when she was in her late 40s before perimenopause. I said in my late 40s too. I think we are nearing that “feeling” state once again. So what results have we seen so far? Marcia has lost about 50 lbs. She had tried many diets and exercise programs to lose weight with little to show. Then Dr. Vilich discovered she had a Thyroid problem that was only discovered by taking two different thyroid tests which her internist doctor never ran. The internist only ran the standard Thyroid test which showed Marcia to be within range. She is off the antibiotic. I also lost 50lbs. I regained my energy and was able to rejoin my golf club and start golfing again. I think if we had gone on this earlier in my life the cancer and surgeries may well have been avoided. I just wanted to sincerely thank you for guiding me in the right path. After months of annoying symptoms of laryngopharyngeal reflux and small bowel bacterial overgrowth, I am now finally symptom free. I also think our preventative plan is on the right track since it’s been 2 months since treatment. From my first appointment with Dr. Vilich, I felt that my health was a collaborative effort. She really listened to my symptoms and ran tests that my health issues stemmed from histamine and SIBO. She prescribed a treatment plan that included: diet, supplements and prescription drugs only when necessary, an approach so different from every other physician I’ve had. And her treatment is working, and I have made vast improvements as a result! I was having severe fatigue and restless sleep, thyroid nodules,craving sweets and having stomach aches. Dr Vilich’s comprehensive recommendations that involved supplements and anti-inflammatory diet and exercise transformed my life. I regained sleep ,energy , my inner strength and acquired new healthy lifestyle . Thank you for helping me rediscover new me! Dr. Fatima is a very devoted and compassionate physician who combines traditional medicine with the latest innovative approach, resulting in a truly comprehensive care for her patients. Fatima introduced me to different methods for weight control and management, based on natural balance of nutrients and exercise She evaluated my “weak points” and proposed measures to keep me on track. I have been implementing the changes that she suggested over several years and that led me to live a healthier life and make reasonable choices for my Family. I have been thrilled with the care I’ve received from Dr. Vilich. Before finding Dr. Vilich, I’d endured two years of relentless fatigue and overall declining health. I was finally diagnosed with an autoimmune disorder, but was told there was nothing that could be done to ease my symptoms. It was a challenging position to be in as a young woman with a family who needed me to be well and energetic. As a last ditch effort, I decided to try an alternate route, a functional health doctor. It has proven to be one of the best decisions I’ve ever made. Dr. Vilich really took her time with me and seemed to take everything I said seriously. She’s been very thorough as far as gathering information through lab testing, but hasn’t relied on labs only and has been willing to treat and advise based on how I feel. Previously I’d been treated based exclusively on where my lab values fell within the standard range, so this approach has been revelatory. Within two weeks of implementing the plan we developed at my initial appointment, I felt better than I had felt in years. I had more energy, was waking rested, and relentless gastro symptoms I’d suffered since being a teenager almost completely resolved. I still have a long road ahead, but I no longer feel worried or scared because I see with Dr. Vilich that I CAN live a normal and full life and feel great. Over the last 40 years I’ve been diagnosed with multiple auto-immune conditions. Uveitis (age 10), MS (age 20), Ulcerated Colitis (age 25), Thyroid Nodules & Secondary Adrenal insufficiency (age 51) In traditional medicine you need to see a specialist for each condition, and they treat the individual disease normally with medicine that has harsh side effects and long- term consequences. For example, and in my case…5 different doctors. Uveitis; Retinal specialist, treated with steroids, which eventually lead to Glaucoma. I now must take medication for the rest of my life. And, by the way, I also see a Glaucoma specialist. MS; Neurologist, treated with immune suppressing drugs. I discontinued on my own because the side effects were unbearable. Ulcerated Colitis; GI doctor, treated with high dosages of steroids, which by the way did not cure the colitis, I ended up having a colectomy, and that still did not resolve my symptoms. Thyroid Nodules and Secondary Adrenal Insufficiency; high doses of steroids for a long period of time (from colitis treatment) lead to Secondary Adrenal insufficiency. Now I must take a maintenance dose of Hydrocortisone every day for the rest of my life. If only I had known then at age 10 or even 20, what I know now after seeing Dr. Vilich. With functional medicine, the root cause is treated. Dr. Vilich has helped me get to the bottom of my multiple auto-immune diseases. Through appropriate testing, diet changes and supplements, my inflammation has decreased, my gut is healing, and I have much more energy. My Uveitis is in remission, as well as is MS. My Thyroid Nodules are just that, no medication required, and they are shrinking. I did recently have a relapse of colitis, and I was very frustrated because I thought I was doing everything right. Dr. Vilich I believe figured that issue out too. Hydrocortisone is coated with lactose, something that I am allergic to! I just want to thank her for the time she takes with me, and her relentless quest to get to the root cause. Dr Vilich got to the root cause of my illness. Four months prior to seeing her, I was hospitalized with numbness in my left arm and leg that came on suddenly one day. I had all the symptoms of a stroke. I was very weak and could not walk unassisted. I had every possible test done; MRI, CAT SCAN, Blood work, EEG, EKG…they all came back normal. I was discharged from the hospital, with orders for physical therapy, but after 4 months I was not making much progress, I was still very weak, and needed a cane to get around as well as I was unable to drive. I went to all my follow up appointments with the neurologist and my family doctor, nobody knew what to tell me. In fact, I was referred to 3 different Neurologists, and all concluded that I needed to see a psychiatrist! Really? They didn’t dispute that my physical symptoms were real, but they couldn’t provide a medical explanation for them. After months of frustration, my wife found Dr. Vilich on the web and suggested I see her. On the first visit, she spent 2 hours going over my health history and reviewing my test results. She made diet and supplement suggestions, specifically to address my DNA mutations. After just 6 weeks of following her recommendations, I started to improve exponentially! My family Dr as well as my Physical Therapists were amazed at my progress. My strength returned, I no longer needed a cane, my brain fog lifted, and I was able return to work. I’m feeling better and stronger now than I have in years! If not for Dr. Vilich, I’d probably still be on disability. Thank you Dr. Vilich! I consider myself a health seeker, always reading and researching about health for myself and my family. I was eating a whole food plant based diet, exercising, living a healthy lifestyle and still, I did not feel great. I carried some extra weight that made me uncomfortable, the pounds would not budge. I had skin issues, felt tired and out of sorts, not ill but certainly not a picture of health, particularly for the effort I put in. I faithfully went to my regular doctor for my annual physical exam and was alway told the same thing…”your blood work is beautiful, see you next year”. It went on like this for 15+ years until a new symptom developed….hair loss. As a woman, that will get your immediate attention. I knew I needed a Functional Medicine doctor that would do intensive detective work into my health, but how to find one? I went to the most famous Functional Medicine doctor I knew of, Dr. Mark Hyman, and from his website learned that Dr. Fatima Vilich was one of a very few Functional Medicine doctors certified through the “Institute of Functional Medicine” and her office was just a few miles from my home. This is an amazing credential, held by only approximately 200 doctors. I made an appointment with Dr. Vilich and my initial visit was like no other doctor appointment I had ever had, so thorough, covering my entire lifetime. Dr. Vilich is a brilliant doctor with so much information to share, she is a health detective and some of the most seemingly insignificant information I shared with her set her on the path of discovery about my health. After consultations and testing she told me I was hypothyroid – which was incredible to me because my regular doctor had checked my thyroid annually, but I learned through Dr. Vilich that a number of tests need to be run on the thyroid to discern if it is functioning properly. I also learned I was anemic and my hormones were out of balance. Through nutritional testing, Dr. Vilich discovered that my body does not retain and store some vital nutrients, so I simply need to supplement with them daily. Fast forward to today, my hair is regrowing, I have lost weight and can eat more without gaining weight, I wake up feeling great every morning, my skin is glowing. I continue to test on a regular schedule to make sure my body is staying in balance and with Dr. Vilich’s guidance we tweak here and there. At age 59, I wear a size 4/6 and feel better now than I did in my 30s and 40s, this is not the norm for a post menopausal woman. My husband who piggybacks on my habits is also glowing with health. I feel it is a privilege to have Dr. Vilich in my life, she is such a kind, caring person, very easy to know and brimming with knowledge on any health issue I ask her about. Everyone should be so fortunate as to have someone like Dr. Vilich as their doctor and health coach. Hi Dr. Vilich, Don’t know if you remember me or not but I saw you about 1.5 years ago regarding Functional Medicine and Rheumatoid Arthritis. I only saw you twice but wanted to let you know where this disease process is at now. SO many people are quick to complain and those are usually the comments we as caretakers hear. This email is the complete opposite! I just wanted to let you know that I have followed your advice on diet and supplements for the past 1.5 years and last week went to my rheumatologist since changing everything. I am happy to report to you that my Dr said “there is absolutely NO evidence of Rheumatoid Arthritis or auto immune disease within your bloodwork or joints!” she continued to say “I wont even categorize you in “remission”, you do NOT have RA!” Of course this news thrilled me, because from the first day of diagnoses, I have refused to “own” this label!!! Just wanted to thank you for your knowledge in Functional Medicine and helping get past this!!! I also gave all the information on Functional Medicine to my Dr who is going to do her own research on this! Here’s to hoping she passes it along to many others that have the label of “auto immune disease”!!! I LOVE My doctor!I am 63 years old and have been searching for a physician with the qualities that Fatima Villich possesses for over 30 years! I feel so blessed to have finally found a doctor who listens to what I have to say about the struggles I have with my health. When I was in my 30’s, I was on 20+ medications, many prescribed for side effects I was having from the medications I was on. Tho I have only been a patient of Dr. Villich for 6 months, she has done more to improve my overall health than any Doctor I have seen in 30 years. I thought I had a clean diet but she has helped me tweak it to improve digestion. She has ordered tests I’ve never had and educates me each time I see her. I realize that I improve with each appointment and know that I have found someone who cares about my health. Dr Fatima and I are a team and I couldn’t be more grateful! Dr. Vilich has guided me into a whole new level of healing and health. Prior to seeing Dr. Vilich, I left 3 other Naturopaths who knew little or nothing about my condition, Small Intestinal Bacterial Overgrowth. I was elated to discover that Dr. Vilich had actually attended the Sibo Symposium, which is an annual event educating people on the condition. She has helped me not only clear SIBO from my intestines, she has helped me to normalize many other important markers, such as homocysteine, thyroid, etc. I am much healthier than when I started and I am very grateful to Dr. Vilich!!! She is knowledgeable, responsive, kind and extremely well-credentialed. I wholeheartedly recommend her! “Dr. Vilich is determined and devoted to finding the cause of diseases and illness that are becoming more prevalent in today’s society. With her combined training in traditional medicine as well as Functional Medicine, Dr. Vilich is equipped to investigate and provide answers where there are none according to traditional medical practice. In addition to her wide scope of knowledge, she has an incredible ability to relate to patients ages 1-100+, and every patient walks out of her office with hope, and a plan to a healthier, disease free life. I started seeing Dr. Fatima Vilich because I was having some chronic health problems related to my digestion, hormones and anxiety that, in my opinion, were not being helped or treated by my regular physicians properly. I felt that my regular physicians were given poor advice pertaining to my health, that I was not comfortable with and that was not acceptable to me. These doctors were not really listening to me, they were merely treating my symptoms rather than trying to help me find the greater problem. I was referred to Dr. Vilich by a family member, after hearing my frustrations. Dr. Vilich listened to all of my concerns and agreed that they were all valid. She sought to try and find the root of my health problems through tests and provided me the tools to help treat them with diet, sleep, vitamins, and additional supplements. One of her best pieces of advise was getting off of the birth control. I had no idea how negatively it was impacting my health. She was all about cleansing the system and repairing the gut, through natural means. I highly recommend seeing Dr. Fatima if you are experiencing chronic health problems and are not satisfied with your regular physicians recommended treatments. I am so much better, and am still noticing improvements so I plan to continue doing what she recommended for me and hope to continue moving in a positive direction. I had severe diarrhea, lost 20 percent of my body weight and had only 5 percent of my energy. I was sleeping 16 hours a day and still had severe fatigue. I could not leave the house and I was desperate. I thought I was going to die and someone would find me in my bed. I had no answers for 20 years with my regular doctors. When I saw Dr. Vilich she knew the exact path to take to my recovery. She addressed my GI problems and found that I had food sensitivities. She was knowledgeable, super understanding and very compassionate. She led me to health. Now I am a new person, full of energy, able to go to church again and attend my grandson’s games. I thank God for her. I do not know what I would have done without her. Thank you Dr. Vilich! I am so grateful that I have found you. My health has improved dramatically within a couple of months after my first visit with you. I have been suffering from rheumatoid arthritis, fibromyalgia and extreme fatigue for the past 2 1/2 years. I have tried several biologic drugs which have made my symptoms much worse. I was also on methotrexate and steroids. There were times I had over 50 symptoms. I went to Mayo Clinic two times last year. I also had several visits to the Emergency Room last year for heart problems. Dr. Vilich was able to get me off all of my medicines. She looked at what was going on on a cellular level in my body, food sensitivities, infections and recommended vitamins, supplements, dietary changes along with life style changes. Everything was based on scientific evidence and she used her expertise to work out a plan that changed my life in a very short time. I now have significantly lower joint pain, fatigue and have lost all the weight I gained from being on the various medicines. Dr. Vilich is very knowledgeable about autoimmune diseases and chronic pain. She is very compassionate and caring. She responds immediately to any questions I have. I never thought I could get off of my rheumatoid arthritis medicines and now I am off the medicine and able to participate in sports I thought I could no longer do. I have more energy to enjoy time with my family and friends. I have been unable to work due to my health. Now I am looking for a career and don’t feel limited to the type of work I can physically perform. Thank you Dr. Vilich! You are an amazing and compassionate doctor. You have given me my life back and a positive outlook on life again. “I am pleased to have met Dr. Vilich recently – I have hypothyroidism and she was able to address this disease with an all natural thyroid medicine which according to my blood work results brought my TSH level back within the normal range after only one week. She is experienced in finding out why patients have chronic diseases and helps find solutions to make them heal. Dr. Vilich has changed my health dramatically. I was looking for a functional practitioner who was also an MD in the Chicago area and found her practice. I have lost 35 pounds in over 9 weeks just by eating healthy foods and my fasting sugars dropped 39 points without any medication. The best part of this journey is the science based approach to medicine and the whole body philosophy. Without her extensive tests, we would have never discovered that I was not digesting fats and taken steps to correct the condition. I am extremely lucky to have found her. Thank you so much for all of your support with Anais. I really appreciate it!! My 13 year old daughter Anais was suffering from severe abdominal cramps for several weeks. Often after meals she would be bent over in pain and unable to function. Dr. Vilich spent almost two hours with her learning every detail about my daughter’s habits, pain and family history. After a series of tests we found out that Anais is suffering from celiac disease. Again, Dr. Vilich took a lot of time patiently explaining to Anais what that meant making sure she answered all of her questions. Dr. Vilich not only provided Anais with a lot of information and recipe suggestions, she actually empowered her to take charge of her own health. Soon after implementing the recommended suggestions Anais began to feel better, but the cramps continued to come back. Dr. Vilich, recommended more testing and discovered that in addition to celiac disease Anais was also dealing with a lot of food allergies which were causing the severe reactions. Even though her diet is pretty restricted for a few months, it has actually come as a real relief to her knowing exactly what is going on and what she needs to do to heal. After two weeks the cramps have finally stopped. Dr. Vilich has been an amazing support to my daughter and thanks to her incredible sensitivity, Anais is now finally starting to regain her health and energy.